Pictures are taken with an actual Digital SLR camera inside the booth for the highest quality photo you’ll find of any all in one Photo booth. The best part is you won’t even see the camera! A professional grade flash strobe inside the booth projects light towards your guests for the best lighting possible in a dark setting. The booth is made of a transparent white plastic and inside are hundreds of LED lights that can change the front and sides of the photo booth to just about any color you want. You can also pick multiple colors so the booth will fade colors in and out at predefined intervals. Have a DJ? Our booth can accept an audio input and even change colors to the beat of the music! 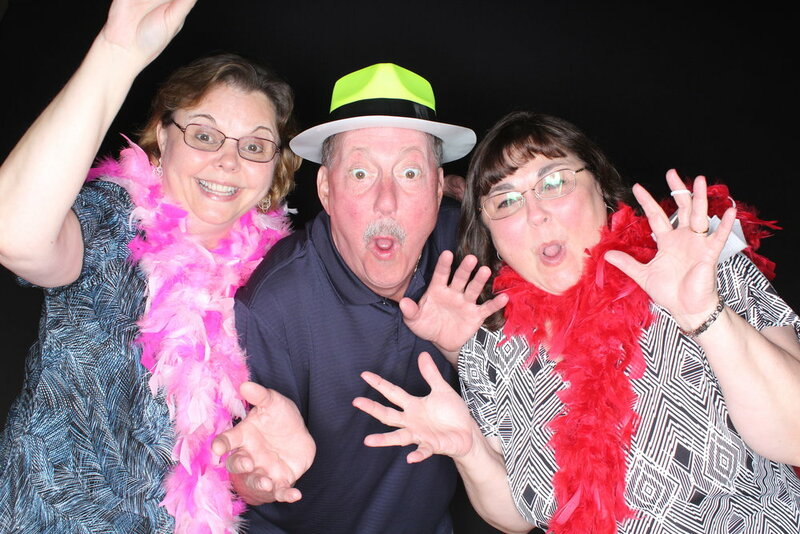 Our photo booth uses software that is very customizable. We can create custom templates with your actual event/company name and date on the photos that are printed. We can print in sizes of 4x6 or 2x6 photo strips. It also has the ability for guests to send their photo digitally via *Email, *MMS or even post to *Facebook! Worried about your guests figuring out complicated software? Not to worry, our easy to use touch screen will have guests taking pictures with a couple of taps of the screen. Our fully interactive touch screen makes it a breeze to start your photo session. We currently have options of black and also green for a green screen effect. What is a green screen you ask? This basically allows us to project a background behind your guests with a picture. That picture can be from anywhere such as Paris, an open field, brick wall, etc. The possibilities are endless. We can discuss this during the initial consultation. All packages are designed to provide a complete system for your event. You are welcome to add additional customization's to any package to make your event as memorable as you want! Additional services are listed below package pricing. Click the plus sign next to the package name for more information. While our packages will cover most any event, you may want to add additional services not listed, tailored to your needs. We understand the need to do this and will work to accommodate all of our customer’s needs. Need more time than our package offers? Add additional hours as needed. One hour of booth idle time - $40 Idle time is any point where the booth is setup but not in use. Keep in mind we arrive an hour before the event to setup, which is included in the rental price. This must be scheduled in advance. Guests can post images to Facebook or send an MMS message directly after the photobooth session. Guests can take their printed pictures and stick them inside the pages of our elegant scrapbook. We also have colorful gen pens for guests to write messages. Please note that a $150 deposit is required when scheduling your event 30 days prior. If it is within 30 days of your event the entire invoice will be due at the time of scheduling. *Power must be provided by the customer. Events more than 20 miles from downtown Lexington will incur a $1.25 per mile charge starting at mile 21.